A good place to start learning hoof anatomy is with the bones of the lower leg. You will find that there are many names for the same bones. I like using the most common names, the ones you will see on message boards and in many of the websites. There are many good resources for anatomy. If you would like the more scientific approach, there are many books, websites and computer programs that can indulge your need for Latin. I like starting simply and building from there. 1. 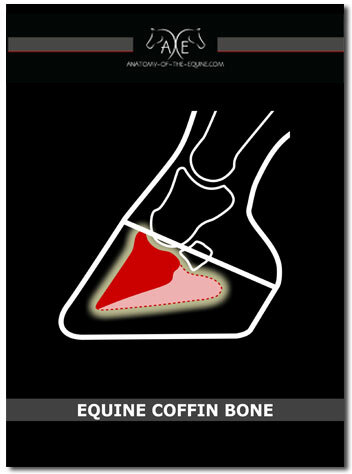 Coffin bone (P3)- The coffin bone is the main boney structure inside the hoof, and is commonly referred to as P3 or distal phalanx. 2. 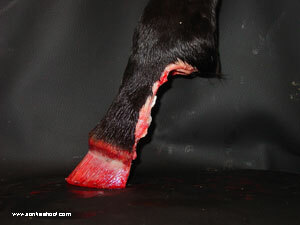 Navicular bone- The navicular bone is also inside the hoof capsule. 3. P2- P2 is actually the middle phalanx. The lower portion of this bone is in the hoof capsule and the upper portion helps make up the pastern. 4. P1- P1 is the Proximal Phalanx. The bulk of the pastern is actually this bone. 5. 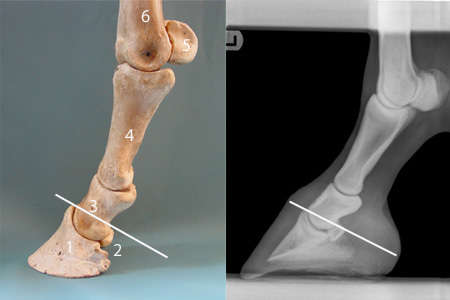 Sesamoid bones- These guys are attached to the metatarsal (cannon bone), so they are part of the fetlock. After you look at this page, go to Anatomy-of-the-Equine, to see more information on hoof anatomy and bones of the lower leg. Here are the same bones strung together and in an X-ray. I have added an imaginary coronary band. See how the lower portion of P2 is inside the hoof capsule? Sometimes, I don't really see what is in front of me. Here is something I just didn't clearly see or somehow missed it's importance. If you look on the X-ray, notice how the pastern and cannon bones are at the very front of the leg? Stay with me, I know this is quite obvious to most of you. But, the importance of this was lost on me. In the front of the leg, the only thing covering the bones is skin, the extensor tendons (which are very flat) and the suspensory ligaments and fascia. The bulk of soft tissue is behind the bones. This is logical, as a horse moves forward the bones of the lower leg shield the soft tissues. Most bad injuries to lower legs occur when the horse backs up or pulls back. Looking at the bones as a shield. Want a set of bones for yourself? 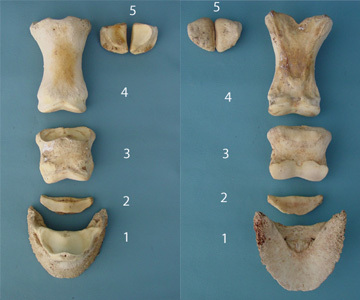 Want to learn lots more about what surrounds the coffin bone?